The addition of a leap second to world clocks on Wednesday caused some networks to crash although most quickly recovered. Some 2,000 networks stopped working just after midnight Coordinated Universal Time (UTC), said Doug Madory, director of Internet analysis with Dyn, a company studies global Internet traffic flows. Nearly 50 percent of those networks were in Brazil, which may indicate that ISPs use a common type of router that may not have been prepared for the leap second, he said. Most of the networks quickly recovered, which may have required just a reboot of a router, Madory said. The Internet’s global routing table, a distributed database of networks and how they connect, contains more than 500,000 networks, so the problems affected less than a half a percent, Madory said. Just after midnight, the number of changes to the global routing table spiked to as much as 800,000 per 30 seconds, according to Dyn. Changes to connections between networks are announced by providers using BGP (Border Gateway Protocol) and propagate across the Internet to other providers. A leap second is added every few years to keep UTC synched with solar time. The difference between the two widens due to the slowing of the earth’s rotation. Since 1971, 26 leap seconds have been added to clocks. Most Internet-connected computers use the Network Time Protocol (NTP) to keep track of time, which is linked to UTC. 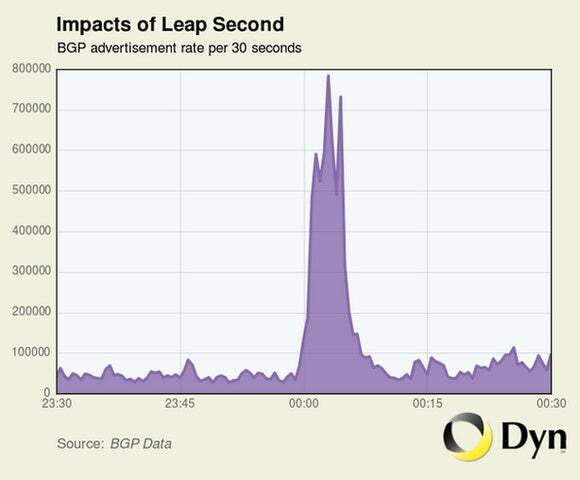 The last leap second, added in 2012, caused problems for Linux systems such as slowdowns or CPU freezes. This time around, however, many companies looked to avoid issues with better preparation.